The Page Turner Études are FROM THE INTERPRETATIONS OF SHEET MUSIC BODY OF WORKS AND ARE, LITERALLY, TURNING SHEET MUSIC INTO SHEET MUSIC. In these works, page turning becomes a musical part, with the timed rustling sounds of the turned paper sheets being integrated into the composition. The arranged page turning parts are writing in a double function to the instrument parts, as such, the performing musician plays two instruments simultaneously. 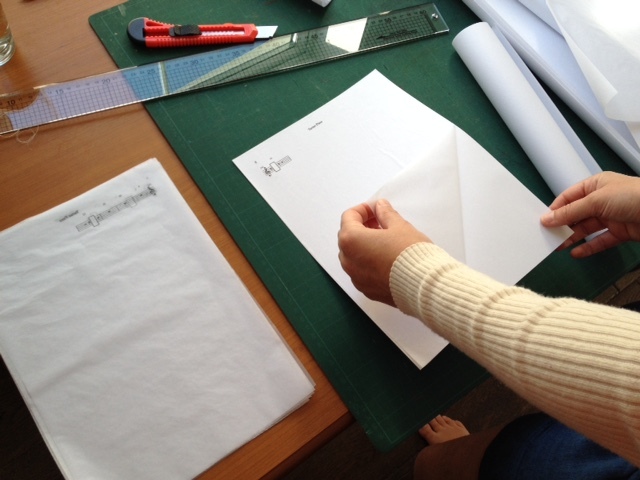 Page Turning scores are handmade and each have their specific designed paper rustling sound. Tuned as a microtonal instrument. 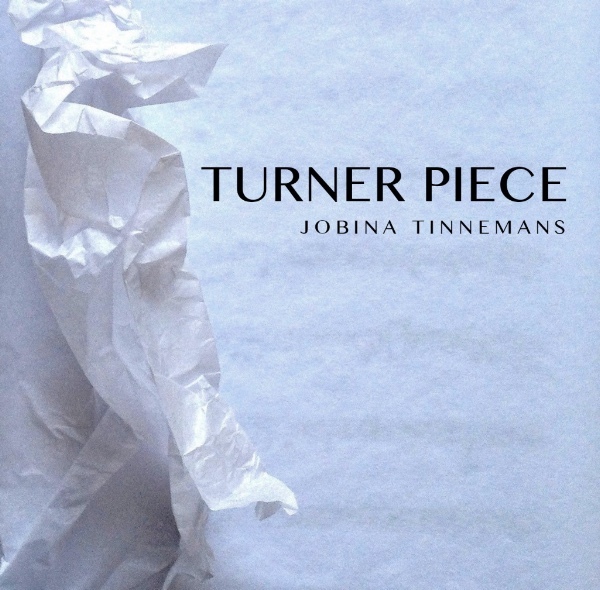 The much celebrated New York pianist Eleonor Sandresky commissioned Jobina Tinnemans to compose Paper pieces for piano solo to include in her concert programme about innovative new music. 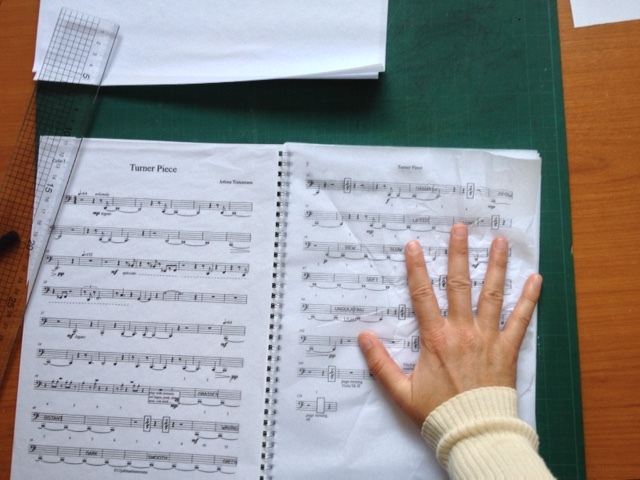 Resulting in three works: ‘Page Turner Étude nr.1’, ‘Page Turner Étude nr.2 – U’, ‘Page Turner Étude nr.3 – Intertidal, Winged Kelp’. The concert starts with Eleonor’s tribute to celebrate the 80th birthday of Philip Glass, highlighting his fearless innovation as an artist, his curiosity about the world and his open heart and mind. Sandresky continues the programme with how this artistic ripple has extended, focusing on work that fulfills this mission on the exciting forefront of new music. These curated pieces, like Glass’ early work, expand the idea of what concert music is and how we experience it. Eleonor Sandresky is a long-time Philip Glass Ensemble member and guest musician with Glass in a number of roles, as well as MATA festival co-founder. Eleonor counts him as one of her most important mentors. Perhaps, to a critical traditionalist, I’m a composer who introduces something as frivolous as ‘dabbling with crafts’ into serious music. Yet, ‘Page Turner Étude nº 3’ amalgamates a plethora of subjects and concepts that might otherwise be overlooked. Many of which I have tried, tested and condensed over time to reduce to its most essential elements, very much inspired by how an elegant mathematical formula can reduce a complex problem to a few symbols only. The problem with electronic music is that it’s dependent on far more external physical parameters than characters printed on paper, a medium that has proved to last for centuries. Going one step further, digital audio developments are even more dependent on non-music related components, both physically and even in their own virtual habitat. A small upgrade of one aspect of third party software might have the knock-on effect of rendering an entire composition to zero. Natural soundscapes offer a great source of textures and fluidity in timing and are a major influence to me. I use field recording samples in my compositions, but in this page turning concept as a minimalist statement I’ve broken down environmental granulated sound textures such as wind, sea waves, rustling leaves, snow, breaking ice into its simplest component – the rustling of the paper the music is notated on. This granulated sound is generated by sculpting spacial dimensions and movement into the single plane medium of the paper sheet. Briefly I studied fashion in Amsterdam – it’s a long story – and seeing couture from a ‘single plane material becoming sculptural’ perspective as opposed to ‘making clothes’ was an eye opener in my case, regardless of whether or not it would end up as a garment. A paper sheet’s timbre and pitch I design per composition and sometimes per page, controlled by choosing the type and size of paper used for the score. 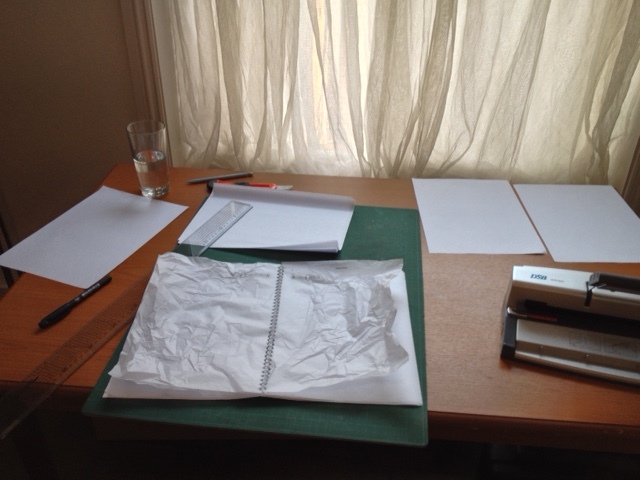 In ‘Page Turner Étude nº 3’ this meant I had to use waxed paper which is impossible to print on or glue anything to. 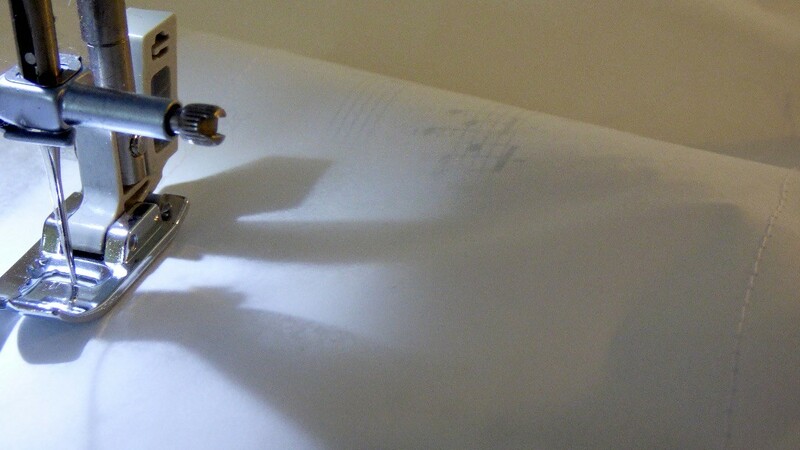 Using a second material and mechanical fixing such as stitching instead, not only attaches the notation, it also amplifies the rustling sounds. I studied design to learn more about composing – that’s another long story – and it’s great to see both disciplines finding their way together so, errr…, seamlessly. Page Turner compositions interweave conventional notation, the classical part, with experimental notation, the contemporary part as single physical entities in one score. Additionally, one performer performs two instrument parts simultaneously, that of piano (in this case) and the page turner part. Both with the same attention to timing and dynamics. In these works natural sound textures are rendered to their most simplified and fundamental component. Being a child of my time, versatility is a mindset – only one digital click away. As such, all Page Turner works can be performed acoustically: I envisioned that technically they could have existed in the 1700s. Alternatively, they can equally be performed by their modern contemporary electronic peers. For these versions I composed dedicated digital, DAW, sound processing packages for each work which colour in the amplified rustling paper sounds textures into the natural soundscapes they are evoking. ‘Page Turner Étude Nº 1-3’, for piano and page turning, are commissioned by Eleonor Sandresky with additional support from the British PRS Foundation Composer Award and will be performed later this year. ‘Turner Piece’, for ensemble and page turners, will be performed in a programme curated by Kate Moore in the Muziekgebouw Amsterdam, early 2019. A quick snapshot from a great concert this Wednesday! Lovely audience and great concert of the choreographic pianist Eleonor Sandresky. In order for Eleonor to prepare for the Café OTO concert, we needed to find space to rehearse whilst being on our trip to Pembrokeshire. Julian and Mami welcomed us in the most warmly heartfelt fashion in their wonderful Lampeter House venue. Their space sounds wonderful. I made some videos I will post I due time. When we were in Pembrokeshire Glen Peters very kindly offered rehearsing space at his Rhosygilwen venue for Eleonor to practice for tomorrow’s concert. 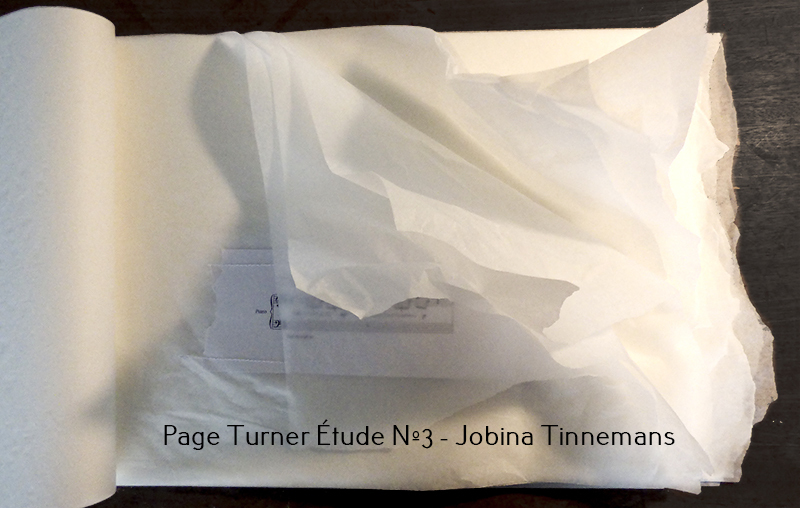 Page Turner Étude Nr.1 is very rich in it’s minimalism – the paper pages are made to rustle very loudly to swap roles: the page turning is the instrument and the instrument, the piano, is the page turning. Eleonor Sandresky performing a great programme of concert and experimental piano music in Cafe OTO July 3rd. Check it out! I’m extremely honoured three works of mine are featured in this concert Eleonor Sandresky will be performing on piano and electronics. “Composer/choreographic pianist Eleonor Sandresky will be performing a concert tribute to Philip Glass in celebration of his 80th birthday in Cafe OTO London on July 3rd. Long-time Philip Glass Ensemble member and guest musician with Glass in a number of roles, as well as festival co-founder (MATA), Eleonor counts him as one of her most important mentors. Today the Apartment House ensemble is going to workshop my three new works – ‘Turner Piece’, ‘Apartment House’ and ‘Metro’. 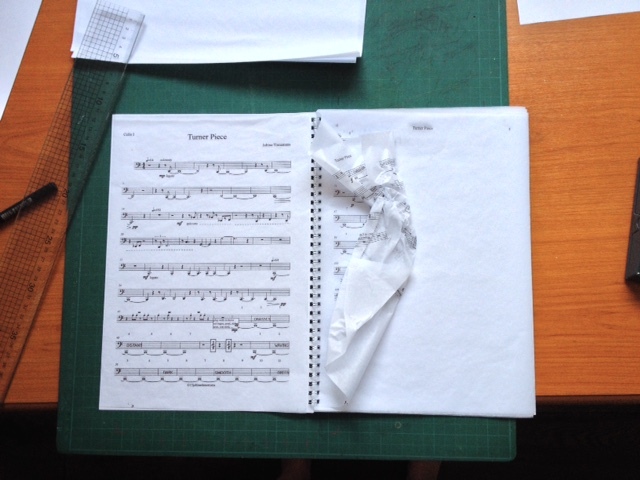 By turning the score’s pages of both ‘Turner Piece’ and ‘Metro’, the sound of paper features as an instrument. I’ve been having a great time going to an art supplies shop listening to their paper qualities. Printing on tissue paper needs some extra attention.